For cutting the gross sample into faced slabs and cutting thin sections from a block. For fast, accurate cuts without metal distortion in applications that include rubber or polymers bonded to metal, try the EXAKT 300 CP with the reversing tool feature. With EXAKT’s capability to reverse the tool direction on its band and rotary systems, you can reduce the “pulling” effect that “single direction” tools have on metal. The outcome is a clearer interface, greater structural integrity of the metal and faster cutting times. Reversing Tool – For fast, accurate cuts without metal distortion in applications that include rubber or polymers bonded to metal try the EXAKT 300 CP with the reversing tool feature. With EXAKT’s capability to reverse the tool direction on its band and rotary systems, the customer can reduce the “pulling” effect that “single direction” tools have on metal. The outcome is a clearer interface, greater structural integrity of the metal and faster cutting times. 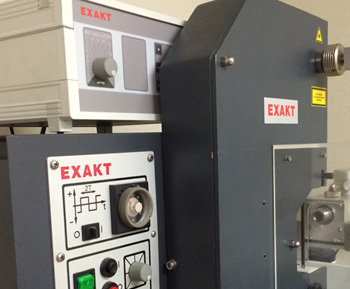 Constant Feed Rate – Recognizing that some materials are so soft that even a very low constant feed force can be excessive, EXAKT provides a system with a constant feed rate mechanism to further inhibit the force at the cutting surface. The CPV option enables the researcher to further slow the rate of cutting if the force at the cutting surface becomes too great. This option is only available on the Band Systems. Automated Serial Cuts – With the addition of the CPVS parallel motion saddle, it is possible to make serial cuts without operator intervention. This option is only available on the EXAKT 310 CPVS Band System. The saws are available in both CL (= Contact Line) and also in CP (=Contact Point). Which system you choose depends on the size of your sample and your requirements for cuts. An EXAKT consultant can help advise with you with respect to areas of application.